"R. testa livido-plumbea, turrita, spiraliter tenue-striata, anfractibus convexis longitudinaliter oblique costellatis; labro alato, mutico, intus albo." the above description is cited by Beck, 1836 as coming from "Beck., in Lyell Catal. of the Fossils of St Laurence-Bay in Geol. Trans. ", which is fide Johnson, 1930 published in 1841 as "Trans. Geol. Soc, London, vol. 6, (2 ser.) 1841 (read April 24, 1839), Remarks on Some Fossils and Recent Shells collected by Captain Bayfield R. N. in Canada," by Charles Lyell." "Testa crassa, sed laevis, opaca , oblongo-alata , depressiuscula, subdistorta, spira elongato-conica, anfractibus 8 1/2 regulariter accrescentibus, convexis, ad suturam impressam paululum coarctatis, testae axim versus sub angulo patulo (graduum circiter 110°) inclinatis. Anfractus infantiles 2 1/2 laevigati; caeteri costis longitudinalibus dextrorsum arcuatis, suturas vix attingentibus, elevatiusculis, rotundatis (in perultimo anfractu circiter 25) ornati, striisque confertis et aequali fere spatio remotis, spiralibus exarati. Ultimus anfractus spira paululum brevior, posterius valde convexus, costisque longitudinalibus obsoletioribus, ante medium evanescentibus, ornatus; anterius oblique attenuatus, subacuminatus, dextrorsum in labrum sat magnum alatforme continuatus, supra striis spiralibus, ad labrum extremum divergentibus, exaratus. Labrum oblique quadrilaterale, posterius late excisum, lobo baseos supra anfractum penultimum decurrente, ad angulum externum protractum, subuncinatum, margine exteriore truncatum, valde incrassatum, angulo superiore obtuso rotundato, margineque anteriore oblique excisa, compressiuscula in apicem columellae abreviato-rostratum dextrorsum inclinatum, continuatum, superne ruga una alterave antiquatum, inferne et interne laevissimum. Apertura oblonga, augustiuscula, subquadrilateralis, posticè ad columellam acuminata, vix canaliculata, anticè in fissuram obsoletam, canalis ad instar, continuata, laevissima. Columella obliqua, posterius subconvexa, medio excavata, subarcuata, antrorsum oblique subulatim producta, aspice obtuso, supra indumento subcalcareo polito tecta, fissura umbilicali longitudinali obsoleta. Color testae extus explumbeo griseus, vel sordide albus, raro in fuscum vergens: apertura intus plumbeo-caerulescens, columella labroque candidis. Epidermis fuscescens, opaca." 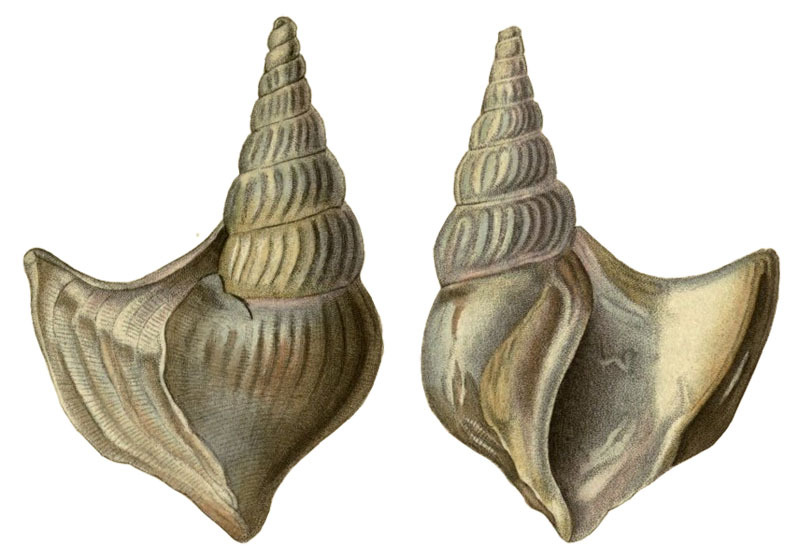 Comment Beck, 1836: "Description and drawing are produced from a shell from the collection of M. Petit de la Saussaye in Paris. 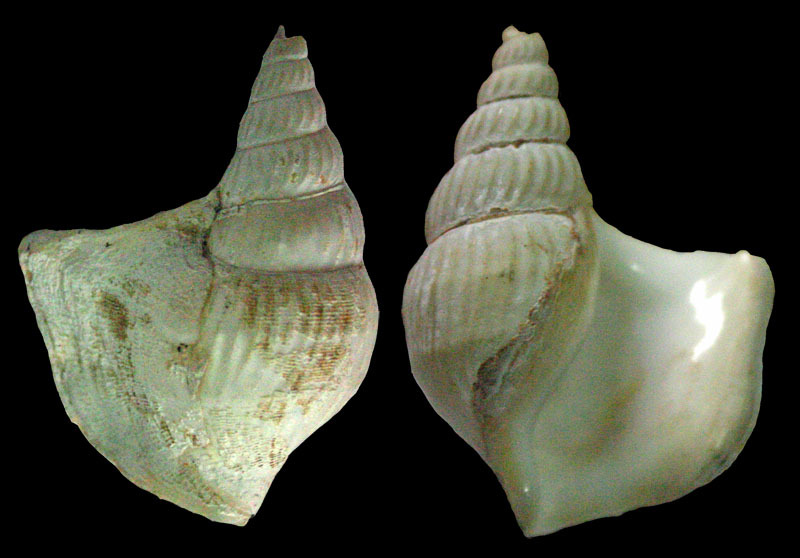 The shell was collected by M. Le Vicaire." Complete shells are found in fishes taken in Newfoundland Banks. Gould, 1841 did not know the animal. Comment Johnson, 1926, p. 134: "The figure by Gould represents this variety [A.o. mainensis]. It was found by Mr. Bryant 20 miles E.S.E. of Cape Sable, N. S., in 70 fms." Comment Johnson, 1930, p. 3: "The figure by Gould represents the typical form [of Arrhoges occidentalis] and not this variety [A.o. mainensis] as stated in 1926." p.421: "...Invertebrata collected at Anticosti and Mingan Islands, by Messr. A.E. Verrill, A. Hyatt, and N.S. Shaler, in 1861 ... (p. 423) ... Aporrhais occidentalis Beck. ..."
p. 426: "Aporrhais occidentalis occured very rarely at Gaspé, as it does on the coast of Maine." p. 427: "... and the following species are characteristic of Labrador and the Banks of Newfoundland: ... Aporrhais occidentalis ..."
p. 428: "Thus with our present knowledge we can approximate very nearly to the southern limits of this shoal fauna, and trace the isolated patches situated upon the cold and unprotected elevations, which rise in the warmer seas of New England; but our imperfect information respecting the range northward of its most characteristic species, does not allow us to speak with much certainty how far up the eastern coast of Labrador these species extend, or whether those few species, which reach Greenland and occur there rarely, may not be considered as foreigners to the soil. For example: of Apporhais occidentalis, which is so profusely abundant in the Straits of Belle Isle, Mörch reports but a fragment from Greenland." "Aporrhais occidentalis Beck. 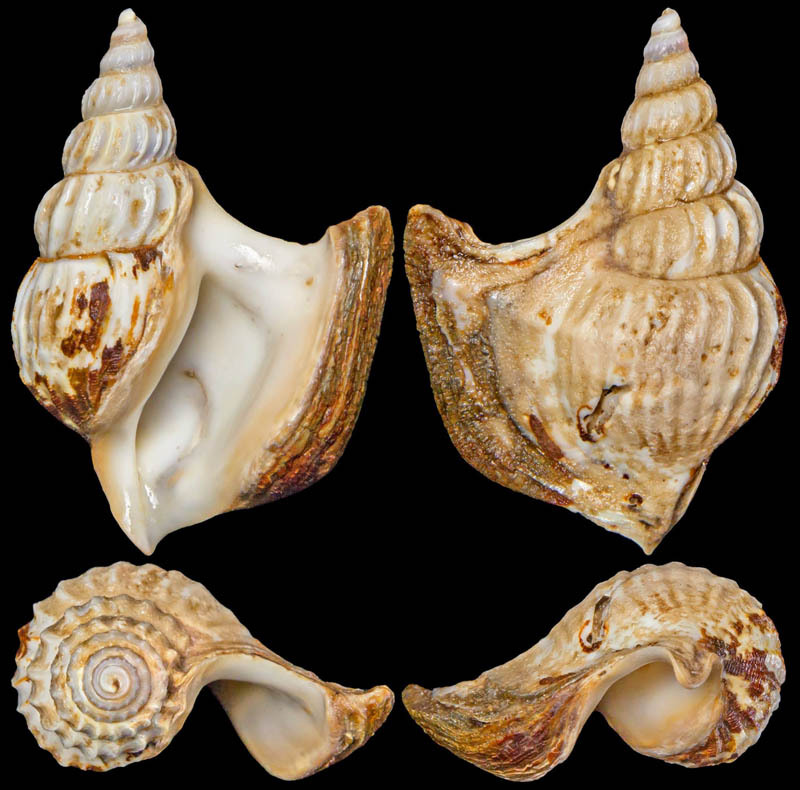 Very abundant on the whole coast from Salmon Bay to Hopedale, and is one of the most characteristic shells of the coast, occuring in from six to fifty fathoms, mostly in muddy quiet bays." "Aporrhais occidentalis (Beck, 1836); (Fig. 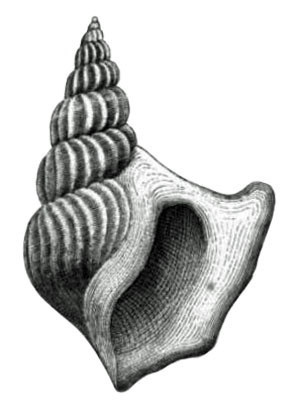 19) is one of the most singular shells that we have. It is rare on our coast, but is common towards Newfoundland." "Contents of a single haul of the dredge made Aug. 13, 1873, on hard bottom, with some spots of mud, in 33 fathoms; locality, six miles east of Seguin Island. [...] Aporrhais occidentalis [...]"
"The specimens from Gulf of Maine and Bay of Fundy differ from the typical form from the Gulf of St. Lawrence northward, in having fewer and more elevated longitudinal costae. 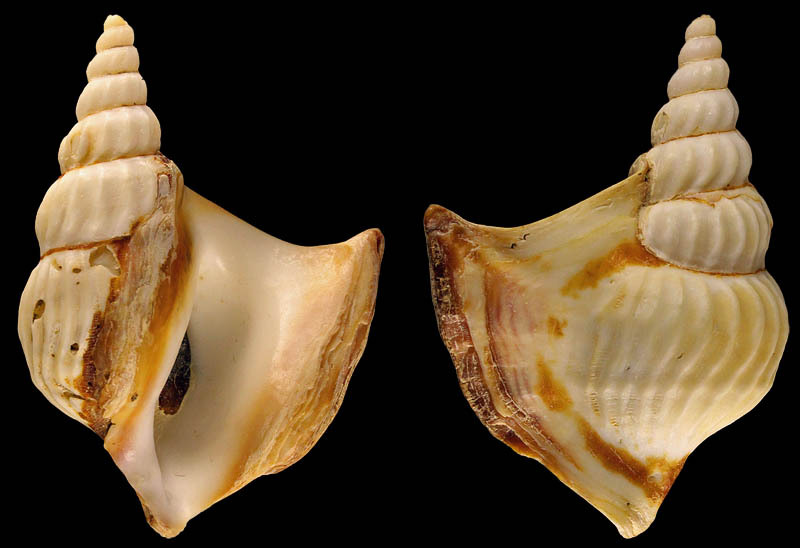 The type calls for 25 costae, while those from the Gulf of Maine have only 14 on the penultimate whorl, the number being quite constant, while those from Labrador have from 22 to 25 costae. In the Gulf of Maine specimen the costae in the young end abruptly at the periphery and the peripheral line is noticable on the entire body whorl to the tip of the wing-like lip, there is also a slight sub-peripheral line; both of these are obsolete or wanting in the more northern specimens." Comment Johnson, 1926, p. 134: "The variety is based chiefly on a large series dredged by Dr. C.W. Townsend in from 5 to 6 fms. near the Gillpatrick Ledge off Northeast Harbor, Maine." "The shell described and figured by Beck is 57 mm. 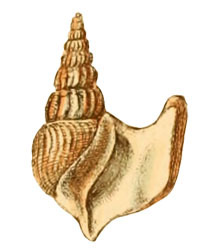 in length, diameter of the penultimate whorl 15 mm., width of the lip 20 mm. 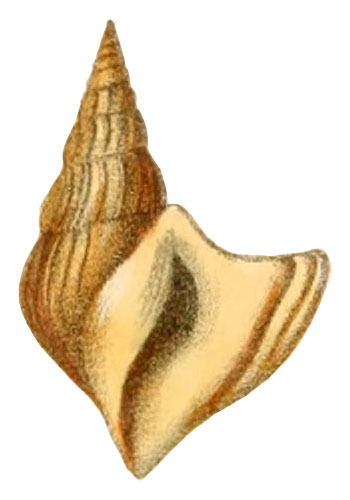 The last whorl has about 25 longitudinal costae. Specimens were from the Gulf of St. Lawrence and Newfoundland. This is the form found in the deeper waters of the Gulf of Maine and in the Gulf of St. Lawrence, varying in size from 50 to 70 mm. The specimen represented by figure 1 is from Newfoundland and is what may be considered as typical. Its length is 62 mm. penultimate, whorl 18 mm. in diameter, width of the lip 25 mm. The penultimate whorl has about 19 longitudinal costae and the body whorl about 25 costae which become obsolete on the expanded portion. 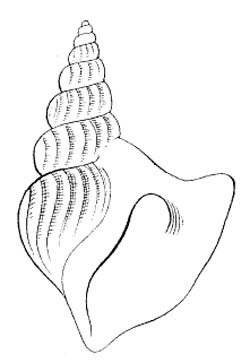 In perfect specimens the entire shell is ornamented with fine raised spirals, but these are usually eroded on the spire, the peripheral and subperipheral ridge on the body whorl often quite distinct. In most cases the extension of the lip extends across the penultimate whorl and in a few specimens onto the adjoining whorl. A fine series was obtained by Mr. W. S. Schroeder of the United States Fish Commission steamer "Albatross 11" in 88 fathoms, off the Isles of Slioals, New Hampshire, the larger specimens measuring 70 mm. The most southern records are the Georges Bank 50 fathoms Lat. 41° 23' N. Long. 68° 40' W. and off Gurnett Point, Plymouth, Mass., 20 fathoms (R. K. Smith and W. F. Clapp). In 1871 J. F. Whiteaves dredged a living specimen in 120 fathoms, N. E. of the Island of Anticosti." "This form is distinguished by its more slender spire and fewer longitudinal costae. The number of costae on the penultimate whorl is 14 and on the body whorl about 18. The young (fig. 6) of this and the typical form are often difficult to separate. The length of the type (fig. 5) is 62 mm. The type lot was dredged by Dr. C. W. Townsend near Gillpatrick Ledge, off Northeast Harbor, Maine, in 5 to 6 fathoms, also taken at Eastport, Maine, 20 fathoms (Hyatt) and at Digby, Nova Scotia, by E. W. Roper. The figure by Gould represents the typical form and not this variety as stated in 1926." 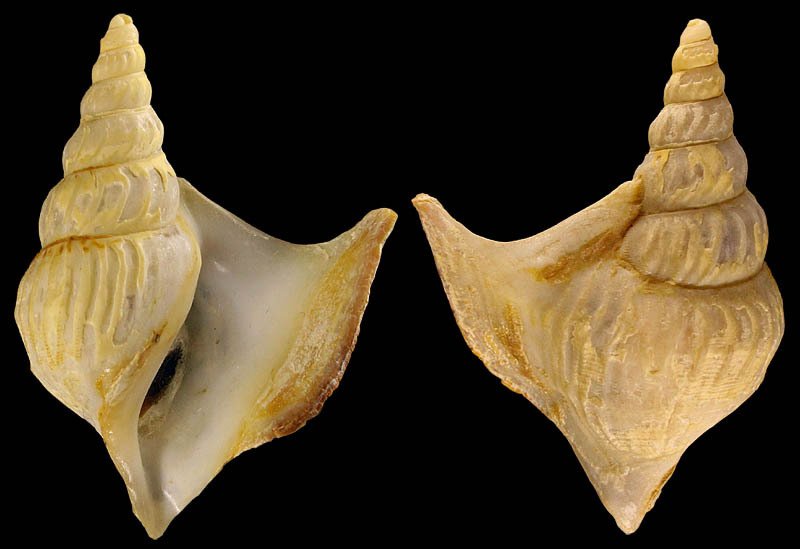 "This is readily separated from the typical form by its smaller size, more slender spire, smaller and more numerous costae and less expanded lip. On the penultimate whorl there are about 24 longitudinal costae and on the body whorl about 29, peripheral lines obsolete or wanting. Width of the lip 15 mm. The lip is confined to the body whorl, usually not reaching the suture and rarely extending onto the penultimate whorl. The length of the holotype (fig. 3) is 52 mm. and of fig. 2, representing an unusually high spire. 63 mm. 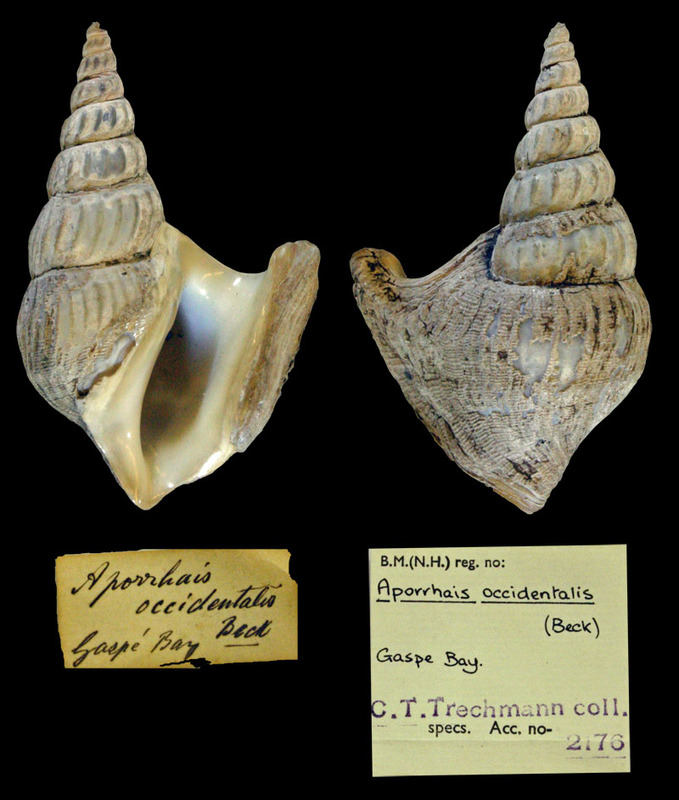 Holotype and paratypes are from Egg Harbor, Labrador, 7 fathoms (Owen Bryant). Most of the specimens from the Labrador coast are badly eroded." "A. (Arrhoges) occidentalis (Beck). (Rostellaria occidentalis Beck, 1836, Mag. de Zool. ; Aporrhais occidentalis Gould, 1870, Inv. Mass., p. 320, fig. 589.) But one specimen was taken by us, just outside of Egg Rock. It would appear to be a more outside form, for it is reported constantly from deeper water and fisherman complain of its boring holes in the fish that are caught in gill nets and reach the bottom, and say that frequently fish are found with several of these large red wounds on them. In the territory extending out from Gilpatrick's Ledge at Northeast Harbor, between Greenings and Suttons Islands, where the best mollusc ground is, Aporrhais is found abundantly. This species has been identified as Aporrhais occidentalis var. mainensis by C. W. Johnston, who has described it in Nautilus. The record shows that this is the only place it has been taken with the exception of the Isle of Shoals. This beautiful animal is found here in great abundance in all sizes and a series is shown in figure 38. We never dredged it at any other place, and Blaney does not report this variety and lists A. occidentalis as rare, and no specimens fully matured. Nova Scotia, St. Lawrence, Labrador Atlantic coast, 10 to 60 fathoms; fossil from Labrador." "Southern record for Aporrhais occidentalis mainensis Johnson. — Last Summer while I was in Barnstable, Mass., a fisherman friend of mine gave me a specimen of this shell which he had found alive in one of his lobster traps, in deep water off Barnstable light. In Johnson's list of New England mollusks "off Duxbury" is the farthest south reported for it." Comment Chong Chen: "The "American Pelicanfoot" is graceful aporrhaid and the only extant species native to the western Atlantic, ranging from Greenland to Nova Scotia, Canada to North Carolina, USA. It is also the only extant species in the genus Arrhoges, although many do not consider this a full genus and still place it in Aporrhais. Compared to the other living aporrhaids its outer lip is simple with only a single projection, while others have multiple spines. It is a herbivorous and detritivorous species feeding on microalgae and detritus, and inhabits sandy to muddy bottoms of a rather wide bathymetric range around -10~400m deep. 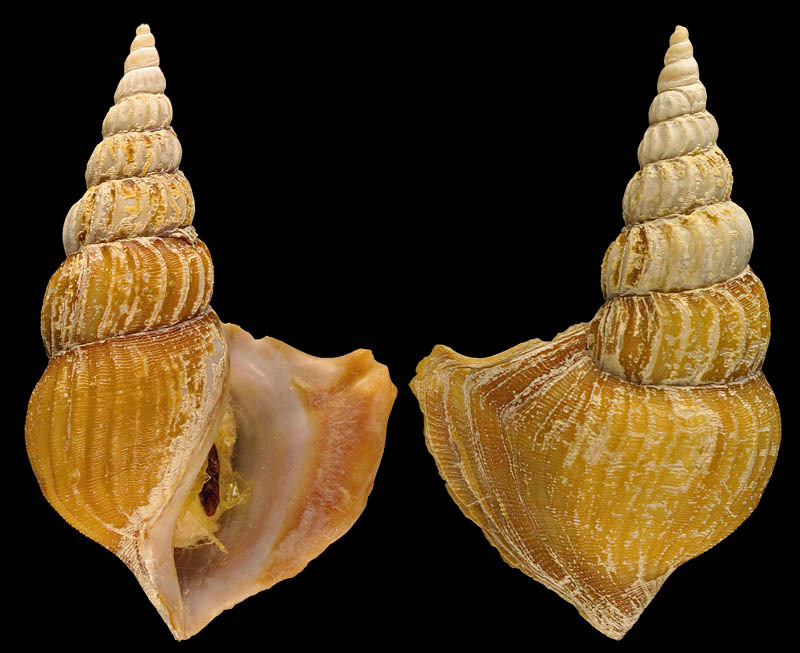 It is a rather rare species in the shell trade, especially live collected specimens of good quality as it is usually a rough shell; most specimens are trawled off Atlantic Canada. It is very variable in spire height; specimens with slender spire bearing relatively few axial ridges has been described as f. mainensis (Johnson, 1930), while those with very high spire has been named f. labradorensis (Johnson, 1930). 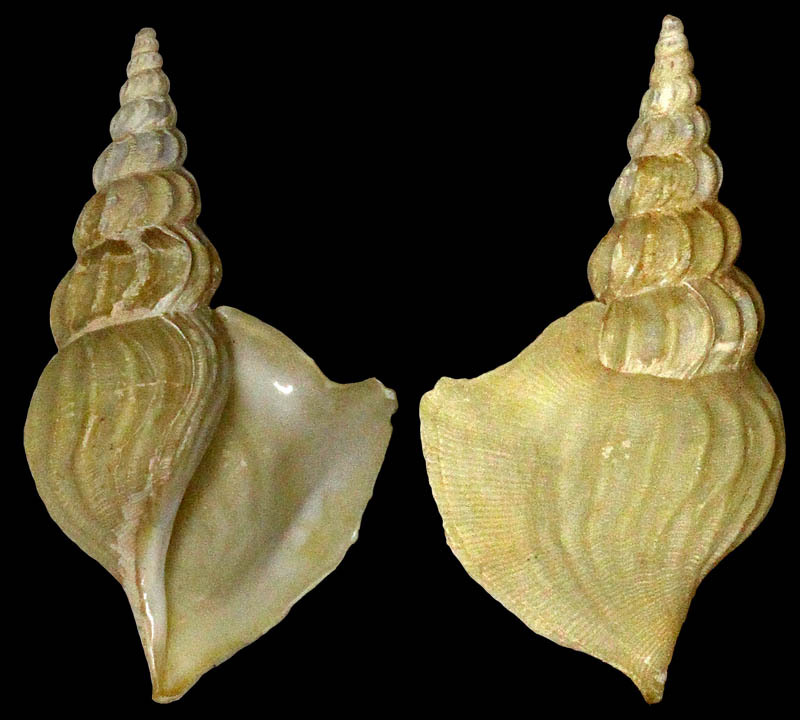 Typical shell length around 50mm, very large specimens may exceed 65mm." Anderson, M., Greene, J., Morse, D., Shumway, С., & Clark, M. (2010). Benthic habitats. JK Greene. BLANEY, D. (1906). A few small specimens found inside dead shells of Chrysodomus decemcostatus Say.-Anemia aculeata Linné. In Proceedings of the Boston Society of Natural History (Vol. 32, p. 23). The Society. Blaney, D., & Loomis, F. B. (1916). A Pleistocene locality on Mount Desert Island, Maine. American Journal of Science, (251), 399-401. Bourget, E. (1997). Les animaux littoraux du Saint-Laurent: guide d'identification. Presses Université Laval. Brunetti, M. M., & Forli, M. (2013). 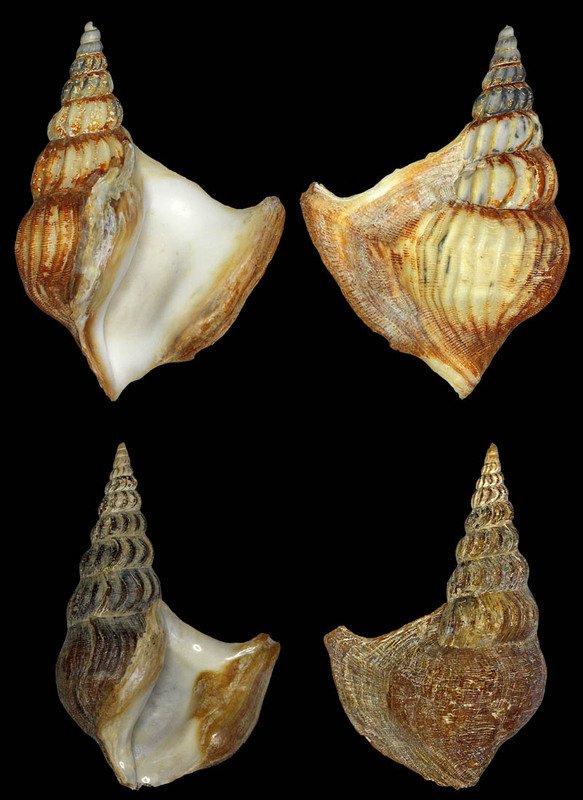 The genus Aporrhais Da Costa, 1778 (Gastropoda Aporrhai-dae) in the italian Plio-Pleistocene. Biodiversity Journal, 4, 183-208. Bush, K. J., & Stearns, W. A. (1883). Catalogue of Mollusca and Echinodermata Dredged on the Coast of Labrador by the Expedition Under the Direction of Mr. WA Stearns, in 1882. Carpenter, P. P., Lea, I., Stimpson, W., Prime, T., & Binney, W. G. (1860). Check lists of the shells of North America (Vol. 2, No. 6). Smithsonian institution. Clapp, W. F. (1912). Collecting from Haddock on the Georges Banks. Nautilus, 25, 104-106. CLARKE JR, A. H. (1962). Sublittoral molluscs and brachiopods from the Gulf of St. Lawrence. Contributions to Zoology, (183), 6. Culver, S. J., & Lipps, J. H. (2003). Predation on and by Foraminifera. In Predator—Prey Interactions in the Fossil Record (pp. 7-32). Springer US. Filippi, M. (1986). Guida bibliografica sugli Aporrhaidae (Prosobranchia: Strombacea). 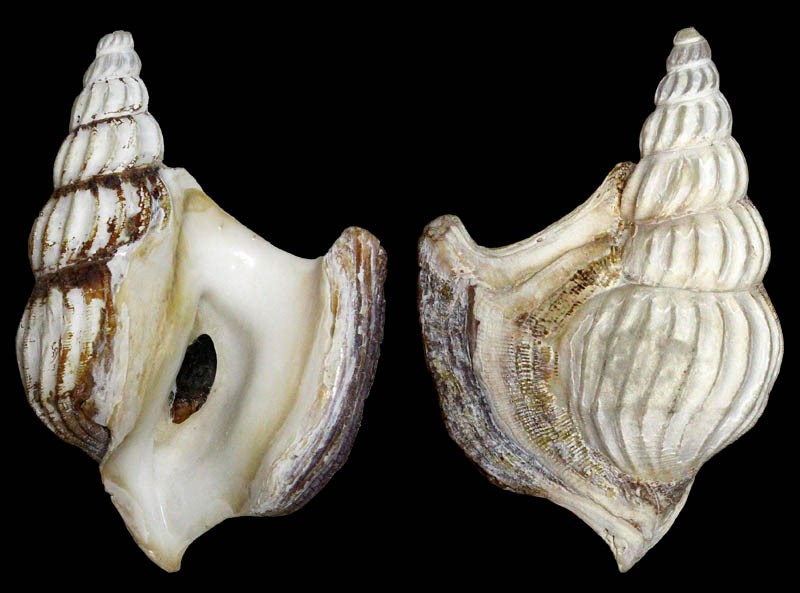 Thalassia Salentina, 16, 73-92. Gardner, J. S. (1873). IV.—Notes on the Genus Rostellaria (or Aporrhais?) of the Gault. Geological Magazine, 10(106), 161-163. Gardner, J. S. (1875). I.—On the Gault Aporrhaïdae. Geological Magazine (Decade II), 2(02), 49-56. Gardner, J. S. (1880). I.—Cretaceous Gasteropoda. Geological Magazine (Decade II), 7(02), 49-55. Gaymer, C. F., Dutil, C., & Himmelman, J. H. (2004). Prey selection and predatory impact of four major sea stars on a soft bottom subtidal community. Journal of Experimental Marine Biology and Ecology, 313(2), 353-374. Gaymer, C. F. (2013). Leptasterias polaris. Starfish: Biology and Ecology of the Asteroidea, 181. Gründel, J., Nützel, A., & Schulbert, C. (2009). 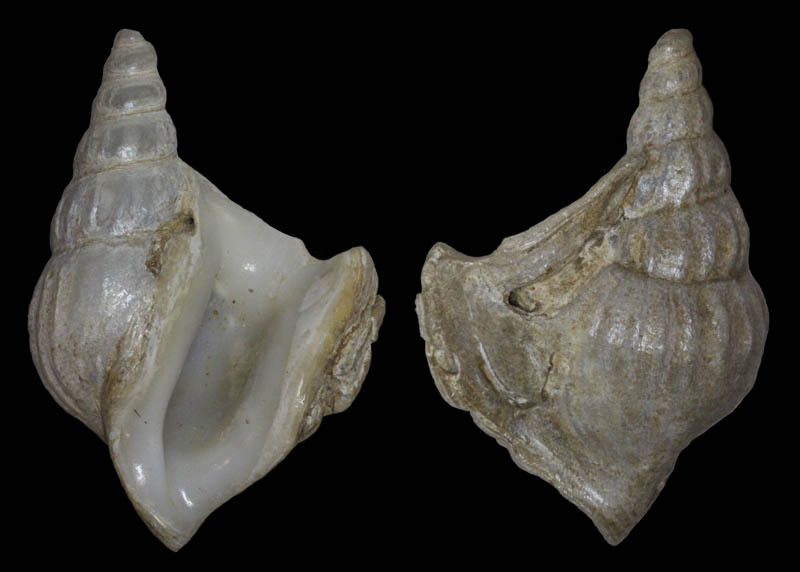 Toarctocera (Gastropoda, Aporrhaidae): a new genus from the Jurassic (Toarcian/Aalenian) of South Germany and the early evolutionary history of the family Aporrhaidae. Paläontologische Zeitschrift, 83(4), 533-543. Himmelman, J. H. Prédateurs potentiels (biologie, écologie et comportement). Atelier de travail «Prédation du pétoncle et gestion des ensemencements», 11. Himmelman, J. H., & Dutil, C. (1991). Distribution, population structure and feeding of subtidal seastars in the northern Gulf of St. Lawrence. Marine ecology progress series. Oldendorf, 76(1), 61-72. Hooper, R. G. (1986). A spring breeding migration of the snow crab, Chionoecetes opilio (O. Fabr. ), into shallow water in Newfoundland. Crustaceana, 257-264. Johnson, R. I. (2009). 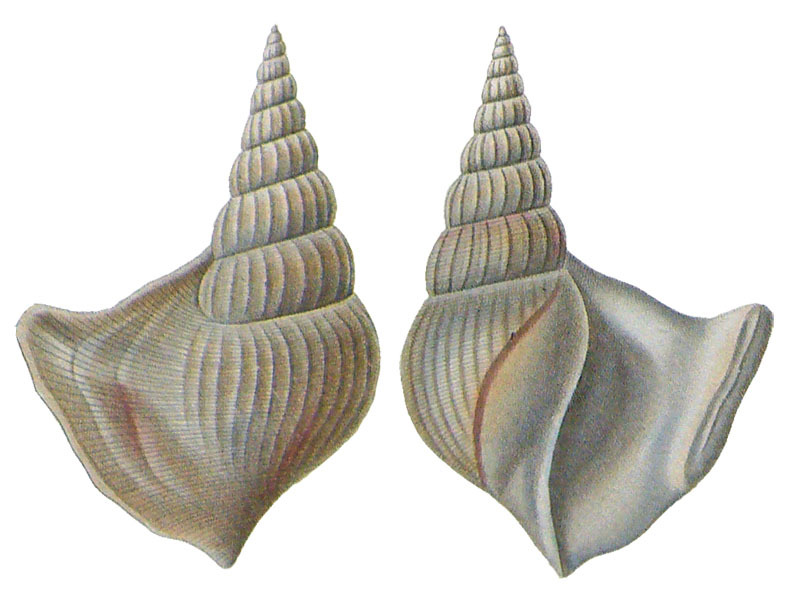 Dwight Blaney and William Procter on the Molluscan Faunas of Frenchman Bay and Ironbound Island, Maine. Northeastern Naturalist, 16(mo4), 1-39. Kiener, L. C. (1845). Famille des Ailées (Vol. 4). Rousseau. Kindle, E. M., & Whittaker, E. J. (1917). XIV: BATHYMETRIC CHECK LIST OF THE MARINE INVERTEBRATES OF EASTERN CANADA WITH AN INDEX TO WHITEAVES'CATALOGUE. Contributions to Canadian Biology and Fisheries, (1), 229-294. Lloyd, M. (2011). Patterns in the larval vertical distribution of marine benthic invertebrates in a shallow coastal embayment. LYELL, C. (1841). 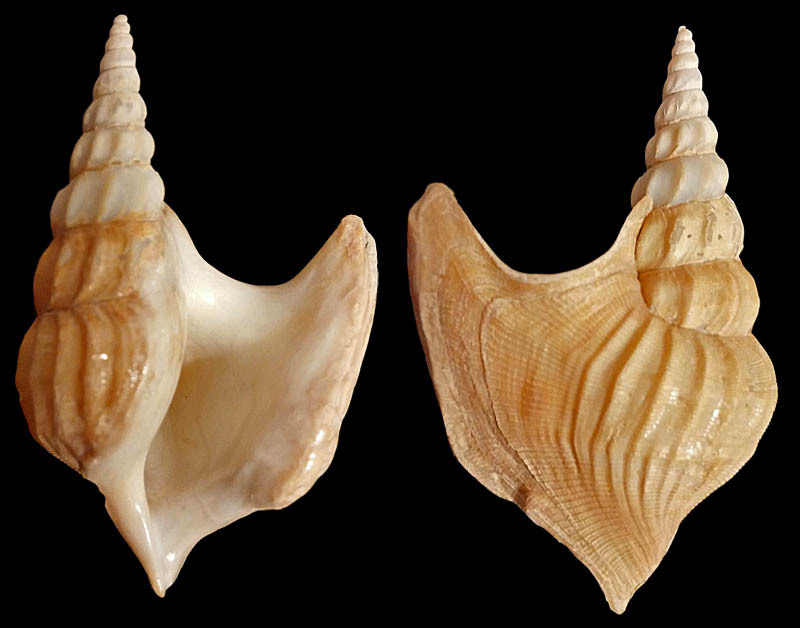 VIII.—Remarks on some Fossil and Recent Shells, collected by Captain Bayfield, RN, in Canada. Transactions of the Geological Society of London, (1), 135-141. Mercier, A., & Hamel, J. F. (2008). Nature and role of newly described symbiotic associations between a sea anemone and gastropods at bathyal depths in the NW Atlantic. Journal of Experimental Marine Biology and Ecology, 358(1), 57-69. Mercier, A., & Hamel, J. F. (2009). Reproductive periodicity and host-specific settlement and growth of a deep-water symbiotic sea anemone. Canadian Journal of Zoology, 87(11), 967-980. Mercier, A., Schofield, M., & Hamel, J. F. (2011). Evidence of dietary feedback in a facultative association between deep-sea gastropods and sea anemones. Journal of Experimental Marine Biology and Ecology, 396(2), 207-215. Moerch, O. A. L. (1857). 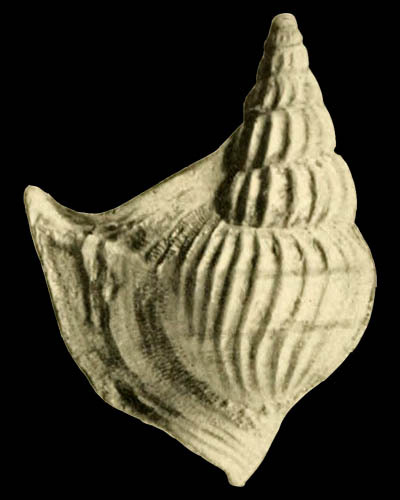 Fortegnelse over Grönlands blöddyr: Prodromus faunae molluscorum Grönlandiae. Klein. Morse, E. S. (1921). Observations on Living Gasteropods of New England. Peabody museum. Morton, J. E. (1956). 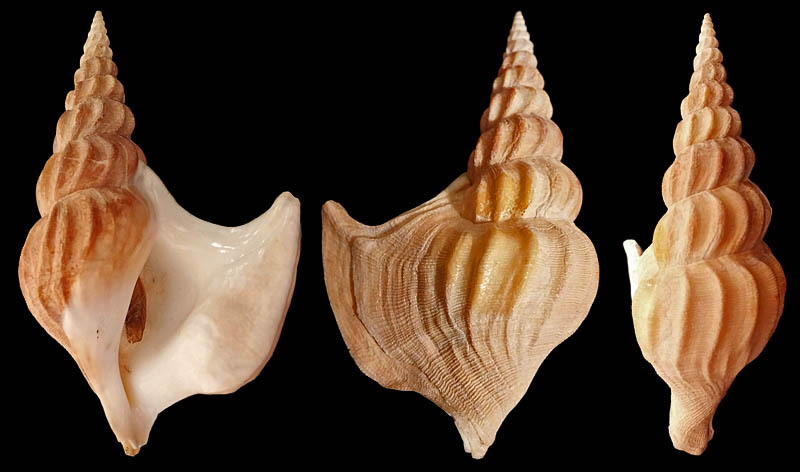 The evolution of Perissodonta and Tylospira (Struthiolariidae). In Transactions of the Royal Society of New Zealand (Vol. 83, No. 3, pp. 515-524). Nadon, M. O., & Himmelman, J. H. (2010). The structure of subtidal food webs in the northern Gulf of St. Lawrence, Canada, as revealed by the analysis of stable isotopes. Aquatic Living Resources, 23(02), 167-176. Packard, A. S. (1874). Exploration of the Gulf of Maine with the Dredge. The American Naturalist, 8(3), 145-155. Packard, A. S. (1885). Life and Nature in Southern Labrador (Continued). American Naturalist, 365-372. Packard, A. S. (1891). The Labrador Coast. NDC Hodges. Perron, F. E. (1978). Seasonal burrowing behavior and ecology of Aporrhais occidentalis (Gastropoda: Strombacea). The Biological Bulletin, 154(3), 463-471. Perron, F. E. (1978). 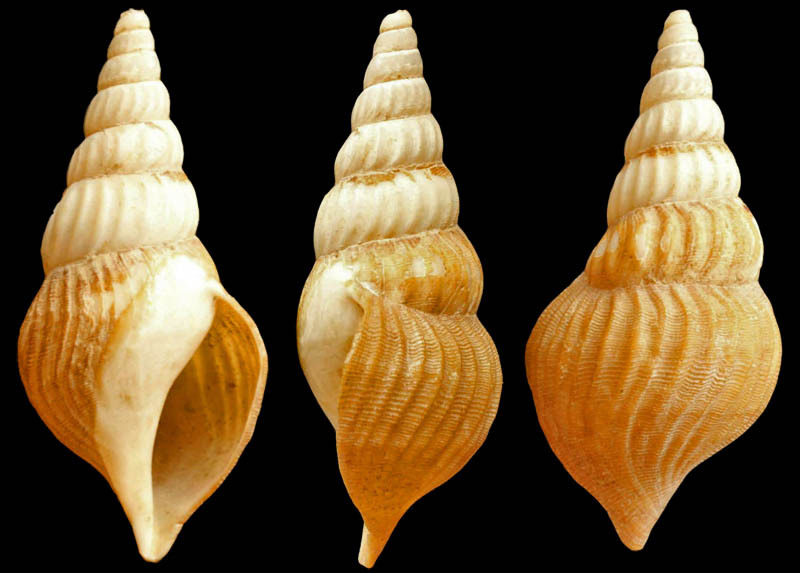 Locomotion and shell-righting behaviour in adult and juvenile Aporrhais occidentalis (Gastropoda: Strombacea). Animal Behaviour, 26, 1023-1028. Rex, M. A., McClain, C. R., Johnson, N. A., Etter, R. J., Allen, J. A., Bouchet, P., & Warén, A. (2005). A Source‐Sink Hypothesis for Abyssal Biodiversity. The American Naturalist, 165(2), 163-178. Rivera, J. J. O., & de Jesús Navarrete, A. (2007). Larvas de moluscos gasterópodos del sur de Quintana Roo, México. Gastropod larvae from the south of Quintana Roo, Mexico. Hidrobiológica, 17(2), 151-158. Rodger, A. (1895). Preliminary Account of Natural History Collections made on a Voyage to the Gulf of St Lawrence and Davis Straits. Proceedings of the Royal Society of Edinburgh, 20, 154-163. Rousseau, J. (1934). The part played by some tidal plants in the formation of clay rhizoconcretions. Journal of Sedimentary Research, 4(2). Roy, K. (1994). 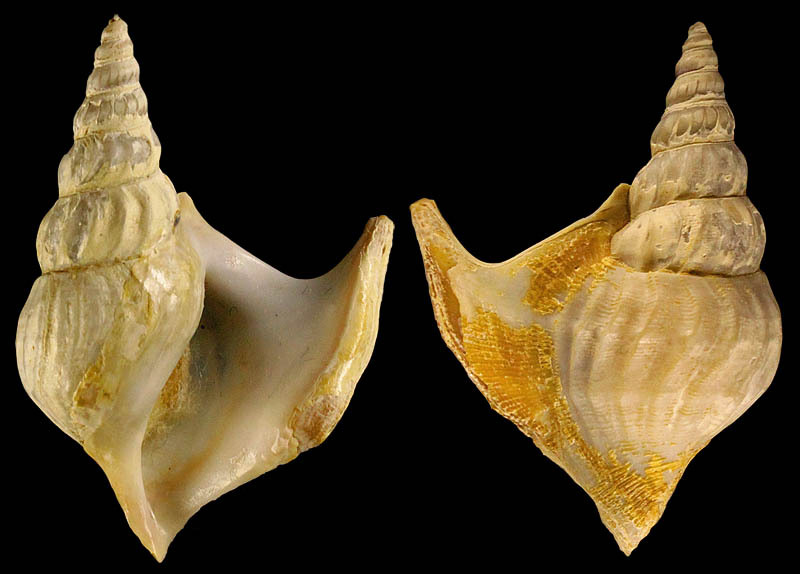 Effects of the Mesozoic Marine Revolution on the taxonomic, morphologic, and biogeographic evolution of a group: aporrhaid gastropods during the Mesozoic. Paleobiology, 274-296. Roy, K. (1996). 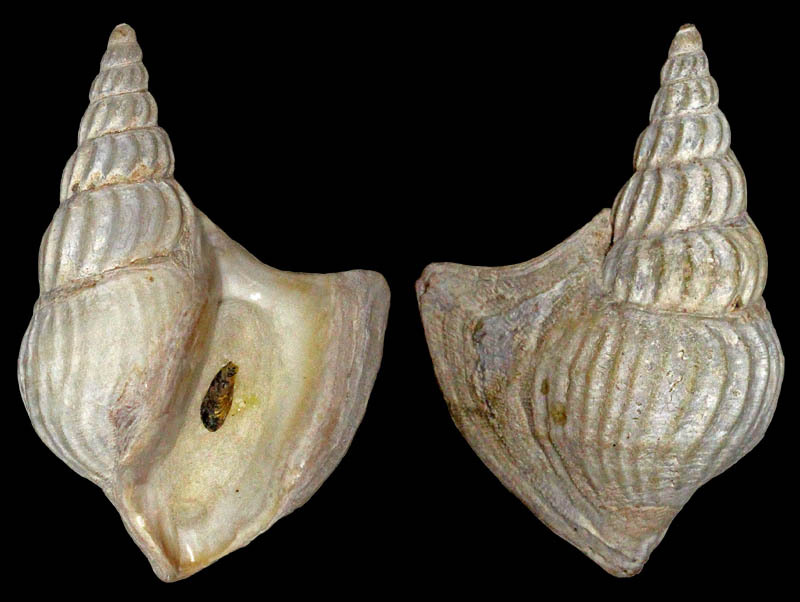 The roles of mass extinction and biotic interaction in large-scale replacements: a reexamination using the fossil record of stromboidean gastropods. Paleobiology, 436-452. Schafer, C. T., & Wagner, F. J. E. (1978). Foraminifera-mollusc associations in eastern Chaleur Bay. Canadian Journal of Earth Sciences, 15(6), 889-901. 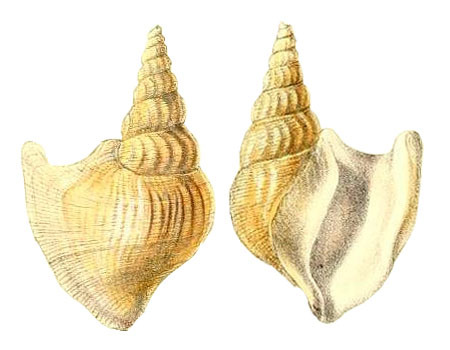 Scheltema, R. S. (1989). Planktonic and non-planktonic development among prosobranch gastropods and its relationship to the geographic range of species Rudolf S. Scheltema Woods Hole Oceanographic Institution, Woods Hole, Massachusetts 02543, USA. In Reproduction, Genetics and Distributions of Marine Organisms: 23rd European Marine Biology Symposium, School of Biological Sciences, University of Wales, Swansea (p. 183). Olsen & Olsen. Short, J., Metaxas, A., & Daigle, R. M. (2013). Predation of larval benthic invertebrates in St George’s Bay, Nova Scotia. Journal of the Marine Biological Association of the United Kingdom, 93(03), 591-599. Stimpson, W. (1851). 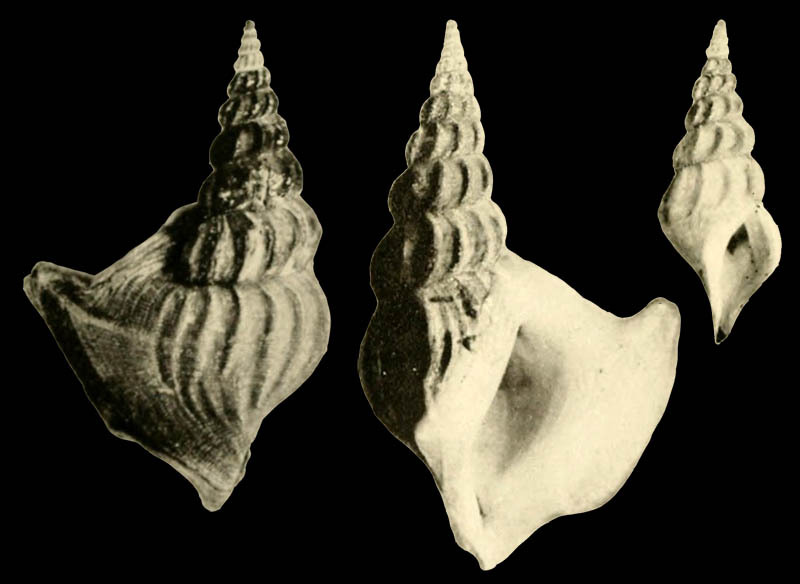 Shells of New England: A revision of the synonymy of the testaceous mollusks of New England... Phillips, Sampson and company. Stimpson, W. (1853). Synopsis of the marine Invertebrata of Grand Manan: or the region about the mouth of the Bay of Fundy, New Brunswick (Vol. 6). Smithsonian institution. Theroux, R. B., & Wigley, R. L. (1998). Quantitative composition and distribution of the macrobenthic invertebrate fauna of the continental shelf ecosystems of the northeastern United States (Vol. 140). US Department of Commerce, National Oceanic and Atmospheric Administration, National Marine Fisheries Service, Scientific Publications Office. Thouzeau, G., Robert, G., & Ugarte, R. (1991). Faunal assemblages of benthic megainvertebrates inhabiting sea scallop grounds from eastern Georges Bank, in relation to environmental factors. Marine Ecology Progress Series, 74(1), 61-82. Trechmann, C. T. (1917). 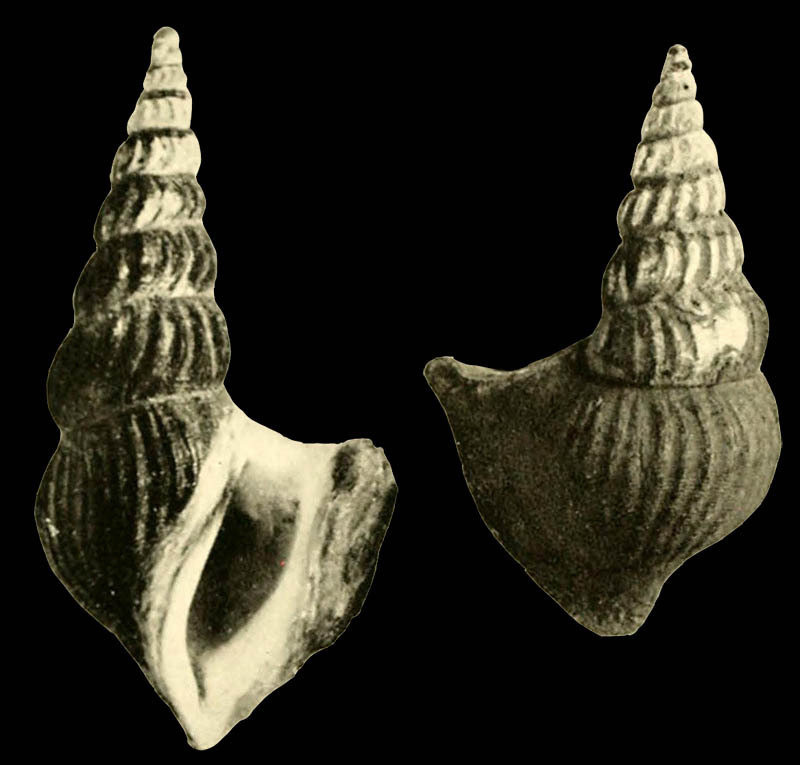 II.—Cretaceous Mollusca from New Zealand. Geological Magazine (Decade VI), 4(07), 294-305. Trott, T. J. (2004). Cobscook Bay inventory: A historical checklist of marine invertebrates spanning 162 years. Northeastern Naturalist, 11(sp2), 261-324. Verrill, A. E. (1874). Explorations of Casco Bay by the US Fish Commission, in 1873. Verrill, A. E. (1879). Preliminary Check-list of the Marine Invertebrata of the Atlantic Coast, from Cape Cod to the Gulf of St. Lawrence. Tuttle, Morehouse & Taylor, printers. Vilks, G., Deonarine, B., Wagner, F. J., & Winters, G. V. (1982). Foraminifera and Mollusca in surface sediments of the southeastern Labrador Shelf and Lake Melville, Canada. Geological Society of America Bulletin, 93(3), 225-238. Weldon, P. J., & Hoffman, D. L. (1979). Kick and thrust foot movements in the righting and escape behavior of marine prosobranch gastropods (Mollusca: Gastropoda). Zeitschrift für Tierpsychologie, 50(4), 387-398. Whiteaves, J. F. (1901). ... Catalogue of the Marine Invertebrata of Eastern Canada. SE Dawson.